The Aprilia SR150 is quite popular among the youths. The powerful scooter offers an eye-catchy design that helps it to sell in good numbers. 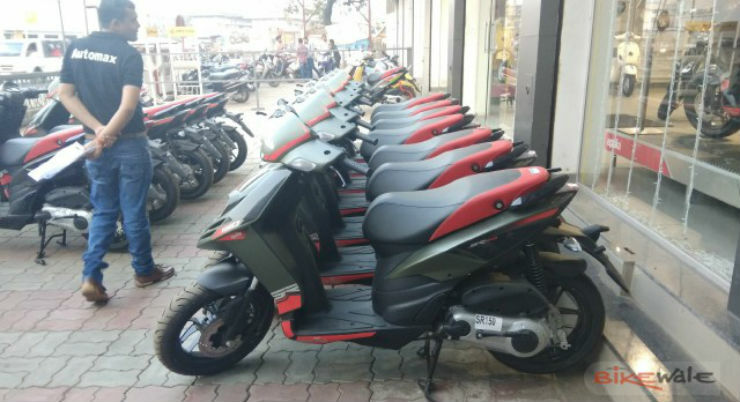 Now, a new green shade of the scooter has been spotted at the Piaggio dealership and it is expected to to be launched soon. The new olive green shade was spotted at the dealerships which means that the launch of the same will be announced shortly. Currently, the scooter is available in Glossy White, Matte Black and a sporty red and green colour. The new scooter is expected to carry the same Rs. 68,160 (ex-showroom, Delhi) price tag forward. There will be no other changes to the scooter otherwise. It will get red and black body graphics and 20-inch alloy wheels wrapped in 120 cross-section tyres. The same colour was spotted last year alongside a new blue colour option but currently, only the green colour was visible in the spy picture. There will be no mechanical changes to the scooter. It will remain powered by a 154.8cc, single-cylinder, air-cooled engine that produces a maximum of 10 Bhp at 6,750 rpm and 11.4 Nm at 5,000 rpm. There is a CVT unit that sends power to the rear wheel through the final belt drive. Front wheel gets telescopic forks while the rear gets hydraulic shock absorber. Braking power comes from a 220mm single disc at front and a 140mm drum brake at the rear. Aprilia SR150 is yet to have a rival in the market. The performance scooter also has a sportier version, the SR 150 RAce, which has a different, sportier colour scheme and also gets tuned suspension system for an aggressive ride. We may see major automakers launching more powerful scooters in the future but currently, the Piaggio Vespa and the Aprilia SR150 remain the most powerful scooters in the budget segment in India.